Power-up your Native & Cross-platform Xamarin mobile apps with secure Backend as a Services. Accelerate time-to-market with Xamarin experts for your business. Enterprise Mobility is transforming the way the enterprises are engaging with customers, partners and employees while exchanging business-critical information. Integrating native or cross-platform Mobile apps with cloud in a scalable manner is more important and equally challenging. This in turn necessitated the demand for powerful mobile backend system that supports core elements like seamless integration with cloud, auto scalability, offline behavior, secure authentication etc. Microsoft Azure Mobile Apps Service as an MBaaS, enables plethora of backend capabilities and supports highly-functional enterprise-grade mobile apps. It consolidates Active directory, single sign-on, integration with databases, Push notifications, Social media integration as well as Offline-Sync features, all in ready to use stage. Our Mobility Team focuses on leveraging Azure Mobile Apps services as MBaaS to build engaging business-critical & user-friendly apps. A Global manufacturing leader of Fiber optic products and equipment revamps its test and inspection products by upgrading to a Cloud-driven Enterprise Mobility Platform. 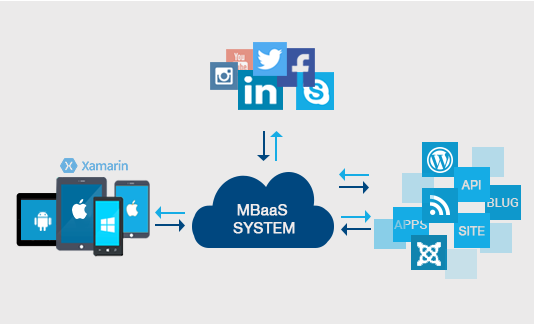 With the growing need for Enterprise Mobility, MBaaS has become imperative to support highly-functional mobile apps. Let’s take a walk through the striking advantages of Azure Mobile Apps Service as MBaaS has to offer.